First, let me confess that I’m having trouble getting excited for this game. Maybe I’ve actually become numb to Navy playing in meaningless bowls, or maybe part of it has to do with the game being played two days before Christmas. I mean, there’s a lot on my mind right now. Should I have asked Santa for The Shake Weight For Men instead of the Perfect Situp? Will my wife resent the pots, pans, iron and vacuum that I bought for her? Did I leave the space heater plugged in next to the Christmas tree? Those concerns aside, this is a big game for Navy, especially for the senior class that can put a fitting end to a brilliant four-year run for the program. With a win against San Diego State tomorrow, Navy will have back-to-back 10 wins seasons for the first time ever. The seniors would have 36 wins in their career, tying a mark set by the class of 1909. Couple all that with four wins against Army, three wins against Air Force and Notre Dame, and four straight bowl appearances, and you have probably the most dominant four-year run in academy history. But what could really make this game interesting is the unusually bad weather hitting Southern California right now. It’s been raining like crazy in San Diego, forcing both teams to practice inside. Navy even had to cancel its trip to Sea World, and the battle of the bands between the two schools was canceled. Essentially, the Navy players and fans have spent far more time inside the hotel than they ever could have expected in beautiful San Diego. The good news — or the bad news, if like me you wanted to watch a mud bowl — is that after more rain today, the sun is forecast to reappear on Thursday. Qualcomm Stadium has been covered during the recent rain, so the field is expected to be fine. If the field is indeed dry, expect this game to have a lot of scoring. San Diego State is 11th in the nation in passing, 19th in total offense and 20th in scoring. Navy has the No. 6 rushing offense in the nation, and the Mids have averaged more than 38 points per game since losing to Air Force 14-6 on Oct. 2. As for San Diego State, they have yet to score less than 21 points in a game this season. 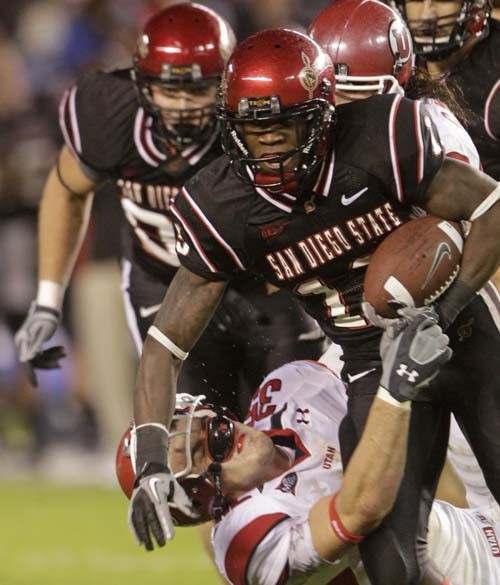 Leading the Aztecs’ offense is quarterback Ryan Lindley and running back Ronnie Hillman, the Mountain West Conference Freshman of the Year. Hillman has rushed for 1,304 yards and scored 14 touchdowns this season. Lindley, a junior, threw for 3,554 yards and 26 touchdowns this season. The two squads have one common opponent this year in Air Force. While Navy turned in one of their least impressive offensive performances of the year in the loss against the Falcons, the Aztecs beat Air Force 27-25 in a game that wasn’t quite as close as the score indicates.